It's the early 1970s in Middlewich Town Centre and the end is nigh for Dewhurst's Butchers Shop (not, you will note, 'Butcher Dewhursts' in this case. That form of address for such Middlewich shops is from an earlier era). Vernon Cooper's shop which stood close by, as seen here, has already gone, its position marked by a Road Works Ahead sign, and the sad remnants of what might be called the 'town end' of Pepper Street linger on, soon to be absorbed into the short section of road which joins St Michael's Way to the end of Wheelock Street. On the extreme right, partially hidden by the No Entry sign at the end of Hightown is Henry Seddon's office building and the only section of Pepper Street to survive to the present day is immediately to the left of it but hidden in our photo by the large bulk of the building at the rear of Dewhursts. To the left of the butcher's shop, waiting to come out of hiding, is The Vaults with its sign just visible. A larger 'Vaults' sign on the Pepper Street side of the building also indicates the presence of the pub.. When the butcher's shop and the large building behind it were demolished to be replaced by a new pub car park that large sign was rescued and stuck on the side of the now exposed side wall of The Vaults, as can just be seen here. Next to the Vaults, all present and correct, are Johnson's the Cleaners and Pimlott's (destined to become Sharon's Cafe in 1977) and the White Bear. 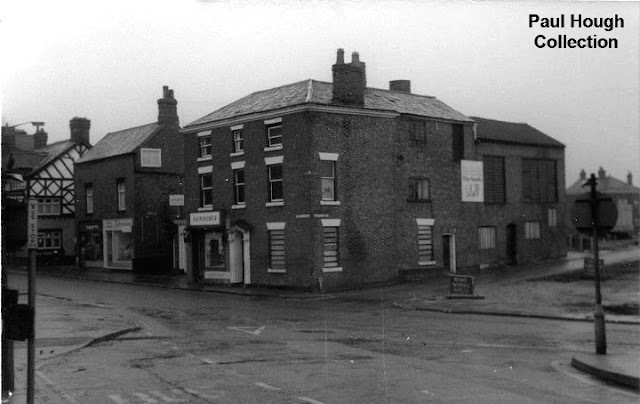 Note the bus stop sign and layby on the extreme left where North-Western and Crosville buses would pick up passengers for Northwich and Winsford and take them there via Wheelock Street and Chester Road in those pre-St Michael's Way days.